Do you have a question about a war that you would like answered? Have you always wondered about a certain element of military history? If so we can help. Please send your military questions to us and we will endeavour to have one of our military experts answer it for you. Is it possible to identify the uniform my relative is wearing? He lived in Kapunda, SA, and died in 1932. This man's uniform doesn’t tell us much but smacks of early Light Horse with the riding breeches, absence of badges and early pattern tunic. If pushed I would say pre-World War One. The horse does not look as robust as many and may not even have a military saddle. 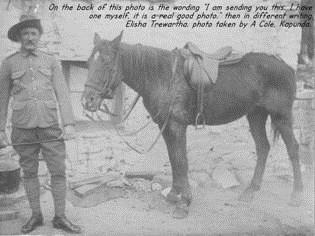 The Kapunda connection suggests this chap was a Part Time Militia member of the 23rd Light Horse Regiment (Also known as the Barossa Light Horse) which was raised in 1912 and disbanded in 1942. My grandfather George William Grasby fought in the first world war. His regimental number was 2139 Rank Private. When he joined he was with the 6th Reinforcements 7th Battalion. He was transferred to the 58th Battalion and then to the 59th Battalion. He landed at Gallipoli on the 8/8/15 leaving in December 1915. He then seems to be at Alexandra, Soraspoum and Tel-el-Kebir. He disembarked ex Transylvania at Marseilles in France on 23/8/16 and then was awarded the Military Medal on 31/10/17 in Ypres. He returned to Australia on board the Kildonian Castle and landed at Devonport on 21/3/1919. How can I find out which battles he was in and where his regiment actually went? My grandfather never talked about the war and it was not until recently that the family even knew he served at Gallipoli. I would love to find out more about his military service. 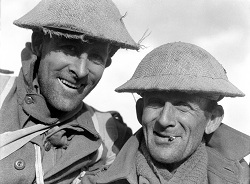 The short answer to identifying in which battles George GRASSBY participated is to refer to the regimental histories for the two units he served with: They are 'Our Dear Old Battalion, The Story of the 7th Battalion AIF 1914-1919' by Ron AUSTIN and 'Give Me Back My Dear Old Cobbers: The Story of the 58th and 59th Australian Infantry Battalions 1913-1942 by Robin CORFIELD. The War Diaries for these and other units are held by the Australia War Memorial and are digitised. It takes a lot of effort to wade through them and of course the key is to identify when the soldier was actually available for 'action' with the unit and when he was not. Note that when the 59th Battalion was raised in Egypt in March 1916, the 'feeder' unit was the 7th Battalion. A couple of spelling points: Alexandria and Serapeum (both in Egypt). Can you please tell me whether the young men who went off to war, were photographed when they enlisted. My grandfather and great uncles enlisted at Blackboy Hill Perth. No they were not. Many had private studio photographs taken and sometimes there is an official group photo which is usually held by the Australian War Memorial. Unfortunately there was no identity photograph as has occurred in more recent times.